© Jonathan Ernst/Reuters President Trump speaks to supporters during a rally in Southaven, Miss., on Tuesday. The three-week maelstrom — from when Ford first shared her story with The Washington Post to Saturday’s expected confirmation vote — fused the nation’s cultural reckoning over sexual assault with tribal politics, carrying ramifications not only for next month’s midterm elections but for the long-term identities of both political parties. “If people look at this as an apocalyptic fight, he’s the ultimate fighter who doesn’t give up, doesn’t give in and doesn’t back down, even if there’s an avalanche of criticism and vicious, vile reactions from the other side,” Conway said. Yet for all of Trump’s public declarations, the actual deciders of Kavanaugh’s fate were a trio of Senate Republicans with an independent streak — Lisa Murkowski of Alaska, Susan Collins of Maine and Jeff Flake of Arizona — whose demands for an FBI investigation prolonged the process but also ended up ensuring Kavanaugh’s confirmation. Republican leaders, who for nearly two years have accommodated Trump’s brushfires in service to a shared agenda, plowed through the chaos to fulfill a wish of the movement right: replacing the Supreme Court seat held by swing vote Anthony M. Kennedy with a conservative ideologue. The GOP’s hardball approach left Democrats shaken and defeated. This portrait of Kavanaugh’s fraught confirmation process is the result of interviews with more than two dozen senators, Senate staffers, White House officials and outside Republican advisers, some of whom spoke on the condition of anonymity because they were not authorized to discuss behind-the-scenes machinations. After three weeks of uncertainty and pitched partisanship, it was Collins on Friday who all but determined the outcome in an extraordinary 44-minute address on the Senate floor. The Maine moderate had signaled her thinking earlier with a “yea” on a procedural vote to move forward, before sitting down to lunch with Senate Majority Leader Mitch McConnell (R-Ky.) in the members-only Senate dining room. Collins struck defiant notes in defense of Kavanaugh and lambasted liberal activists and senators, whom she argued never gave the nominee a fair shake. Although she said she found Ford’s testimony “sincere, painful and compelling” and believes she has survived a sexual assault, she explained in some detail that she did not see any substantiating witnesses or evidence for her claims that Kavanaugh was the aggressor. McConnell led the Republican senators — nearly two dozen in attendance — in a standing ovation. One by one, Collins’s compatriots celebrated her decision. Senate Judiciary Committee Chairman Charles E. Grassley (R-Iowa) enveloped Collins in a giant bear hug. Within moments, Sen. Joe Manchin III (D-W.Va.) became the only Democrat to say he would vote to confirm Kavanaugh, and coupled with Flake’s earlier expression of support all but guaranteed the nominee’s ascension to the Supreme Court. From the moment Kennedy announced his retirement on June 27, the White House realized the battle to fill his seat would be far more difficult than the one for Justice Neil M. Gorsuch to replace the late Antonin Scalia. Picking a successor for Kennedy’s swing seat gave Trump an opportunity to solidify a conservative majority on the court for decades to come — and White House advisers decided they would need to mount a vigorous political campaign. The chief strategist was Donald McGahn, the White House counsel who has had a tempestuous relationship with Trump but rose up through the conservative movement. Trump, too, understood the stakes, aides said. If he could solidify the Supreme Court’s conservative majority, the president calculated, that move alone could permanently endear him to Republican voters — especially evangelical Christians — and override doubts about how he conducts himself in office. Nevertheless, Trump felt invested in Kavanaugh, and he entrusted McGahn, with whom the president barely was on speaking terms, to muscle through this final victory before departing the White House later this fall. Supreme Court nominee Brett M. Kavanaugh testifies before the Senate Judiciary Committee on Sept. 27. 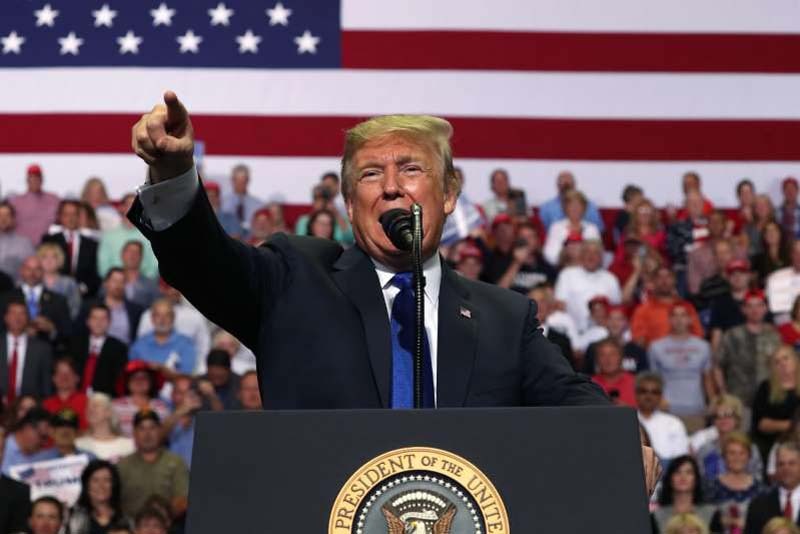 President Trump speaks to supporters during a rally in Southaven, Miss., on Tuesday. McGahn built a war room on the fourth floor of the Eisenhower Executive Office Building staffed with nearly a dozen lawyers, two communications operatives and a stable of Kavanaugh’s former law clerks. A farm team at the Justice Department conducted research and drafted talking points. Leonard Leo, a longtime leader of the conservative Federalist Society, and to a more limited degree Republican lawyer William A. Burck, were key advisers. And an assortment of well-funded outside groups, including the Judicial Crisis Network, worked to buff Kavanaugh’s public image through television and online advertisements and surrogate media appearances. The team treated Kavanaugh like they would a presidential candidate, including choreographing his public movements. When Kavanaugh visited Capitol Hill, McGahn and an entourage of clerks and aides accompanied the judge to meetings with senators and devised routes to avoid interactions with protesters. Still, even the Kavanaugh operation drew pointed criticism from Republican allies on Capitol Hill and others in Trump’s orbit, who at times privately questioned everything from the selection of Kavanaugh himself to the war room’s ability to effectively manage a bloody-knuckled partisan brawl. The initial Ford allegations momentarily sent the White House reeling, as they scrambled to assess her credibility and the veracity of her claims. The president was immediately advised, including by Conway, not to attack Ford, but to say that she deserved to be heard — a line he stuck to for several days. 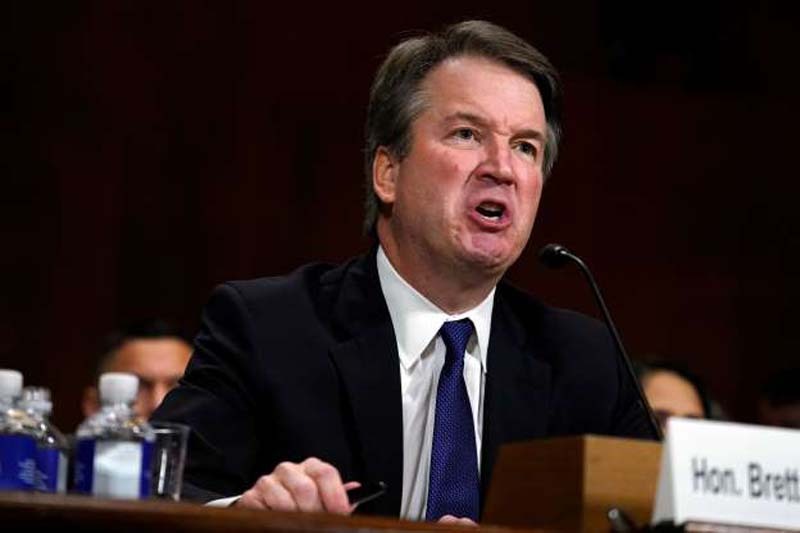 In the coming day, stories of Kavanaugh’s alleged debauchery as a high school and college student dribbled out from former classmates, as well as two additional claims of sexual misconduct: Deborah Ramirez claimed in the New Yorker that Kavanaugh had exposed himself to her as an undergraduate at Yale University, and Julie Swetnick, represented by attorney and potential Democratic presidential candidate Michael Avenatti, suggested that Kavanaugh had been present at parties where women were gang-raped. But the additional claims had an unexpected effect: Widely deemed less credible than Ford’s assault allegation, they gave Kavanaugh’s supporters fresh ammunition to cast all of the charges as a political hit job. Kavanaugh, a former political staffer who had micromanaged his confirmation process and media coverage of his nomination, was eager to defend himself publicly — and McGahn, McConnell, Trump and other advisers were encouraging him to do just that. Kavanaugh and his wife, Ashley, sat for a television interview with Fox News Channel’s Martha MacCallum. The interview was widely criticized — “objectively a horrible idea,” in the words of one White House official. Kavanaugh appeared wooden and dispassionate, sticking only to a few talking points, and Trump, an avid consumer and critic of television news, thought he appeared weak and unconvincing. But the Kavanaugh team believed the Monday sit-down served its purpose: He was on camera denying allegations in clips that helped fill the news vacuum in the run-up to that Thursday’s scheduled Senate testimony from him and Ford. “It filled the void,” a second White House official said. Then came the whiplash — more than eight hours of Senate testimony, first from Ford, then from Kavanaugh, that captivated the nation and even left the president seesawing from fatalism to enthusiasm about Kavanaugh’s confirmation prospects. When Ford had finally finished, McGahn spoke privately to Kavanaugh, who had not watched, urging him to be passionate. “Speak from your heart,” McGahn advised the nominee, according to someone familiar with their discussion. Kavanaugh roared into the committee room and shouted his opening statement, which he had personally written the night before with the help of one trusted clerk. The hotly defiant performance was so effective in the eyes of his advisers — and, perhaps most importantly, of the president — that a group gathered in Vice President Pence’s Capitol Hill office began to cheer and pump their fists. Some even had tears in their eyes. The hearing galvanized activists on both sides and left jittery senators — including Flake, one of 11 Republicans on the Judiciary Committee — torn between competing accounts and party loyalties. Flake, who has repeatedly criticized Trump’s rhetoric and had been positioning himself as the pivotal swing vote on Kavanaugh’s nomination, decided to vote “yes” last Friday to advance Kavanaugh’s nomination from the committee to the full Senate floor. In the closing days of the Kavanaugh fight, Trump’s role was mostly public-facing. His aides conceded that the president would not have much sway with the trio of Republicans who were on the bubble. “I think in terms of the people that we needed to in the end win over, it’s sometimes the less said is better,” Thune said, referring to Trump’s role.